Natural Products have become the preferred substance of all healing these days we learn more about the harmful side effects of chemicals and drugs. We want to live a healthier way that is in commune with nature and what's best for us. Thus, people everywhere are turning to a precious substance of nature that has been a round millions of years, natural Baltic Amber. Amber is referred to in any number of ways as its healing powers are multifold. Some think of Amber as a powerful "chakra" a cleanser and healer. Others give testimony to the fact that wearing natural Amber Necklace provides amazing pain relief for head, neck and throat areas, most especially for congestion. Amber Necklaces are used to help control and alleviate pain of rheumatism, arthritis, and aching muscles and joints. Baltic Amber is also a perfect remedy for abdominal, bladder, kidney, liver, blood, and eye trouble and it also aids in producing tissue revitalization. Amber draws disease out of afflicted areas and neutralizes negative energy allowing the body to heal itself. Even more impressive, Amber is also an anti-anxiety solution that eliminates fatigue and weariness and strengthens your memory and intellect thereby providing a feeling of peace and feeling "great" all day long. Whether your 1 year or 50, there is a very important place in your life for Baltic Amber. So what is the magic in wearing Baltic Amber Necklace? The magic is Baltic Amber. Amber is the only Fossil Resin containing 3 to 8% of Succinic Acid which acts as a major therapeutic substance to the human body. Succinic Acid was analyzed by the pioneer of modern bacteriology, the Nobel Prize winner, Robert Kock (1886), who confirmed its positive influence and discovered that there is no risk of the accumulation of surplus amounts of Succinic Acid in the human organism, even after the introduction of considerable amounts into the body. Interesting to note that Nicolaus Copernicus documented that his formulas for medicine included 22 specific ingredients - and one of them was Amber. Only purchase from experienced craftsman that specializes in Baltic Amber. 90% of all jewelers are uneducated, misinformed or simply many don't understand the product they are selling. Be certain that Amber Necklace is made of real Baltic Amber, not copal or any other cheap replica product. Purchase Necklace from a company with a solid return policy. Amber Necklaces always look great in a photograph but may appear different in natural lighting, so it's important to be able to exchange or return your Amber Jewelry if necessary. Many factors influence the pricing of Amber Necklace. Color, weight and shape of Baltic Amber beads are some of obvious ones, but Amber is also priced according to its age, proportions, quality, and inclusions. 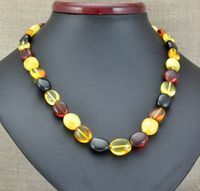 So whether you're looking for the beauty of Baltic Amber Necklace to adorn your body or to heal it, try Amber Necklace. It can change your life in a most fulfilling way.